On the first day you decide to put students in collaborative seating or work groups, this "lesson" allows students to get to know each other first, and finally, you as a teacher. 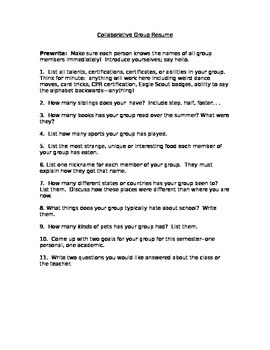 Students will create a "resume" of their group, asking interesting or funny questions that they will write down to share with the class. As a first day ice breaker, students immediately bond with classmates and finally ask you questions to alleviate stress or worry over beginning of the school year jitters!